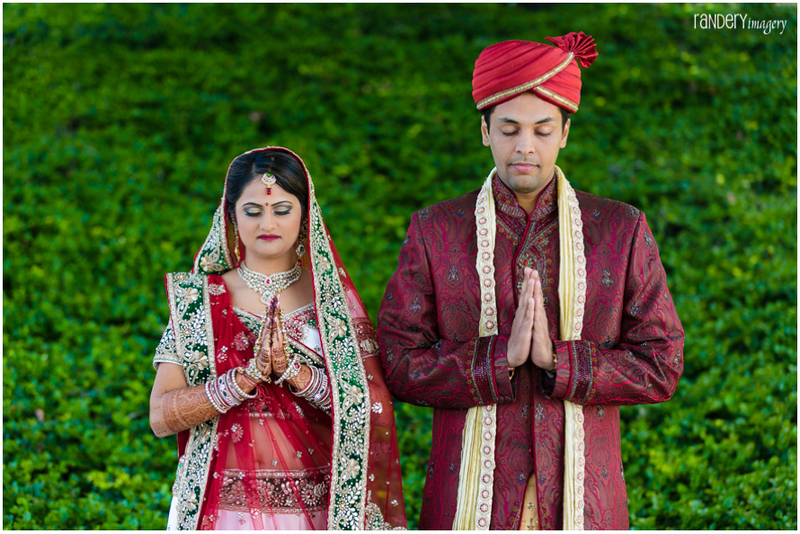 Anand’s last name is Bhatt too, so I’m all set – no name change! Woohoo! 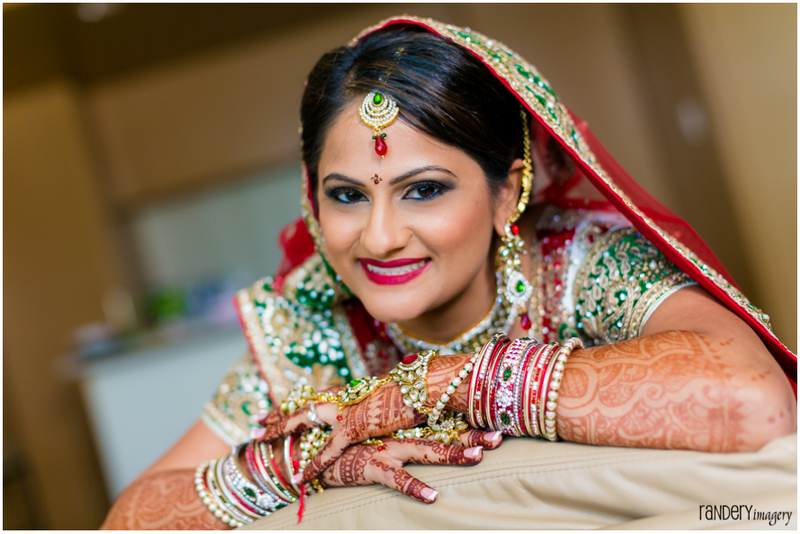 How much time lapsed between your engagement and the wedding day? At what point did you hire the wedding coordinator? 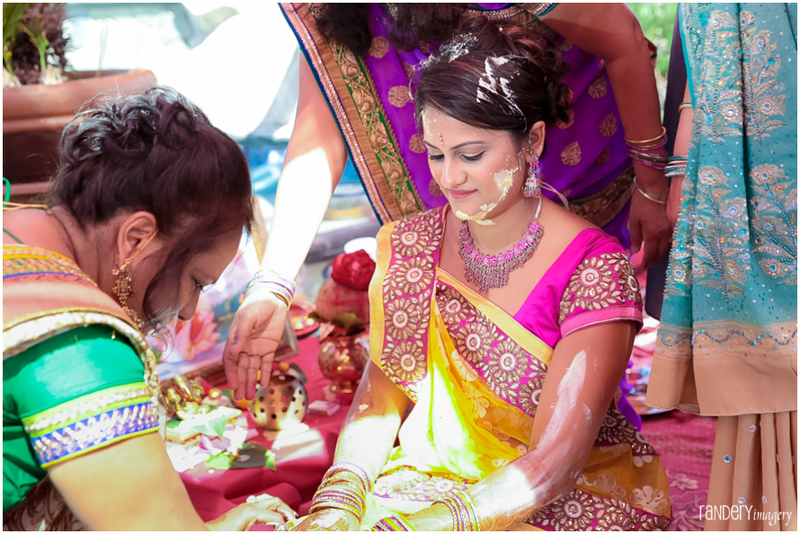 We had selected most of the vendors – photo/video, food, pandit, venue, and the DJ were already booked. 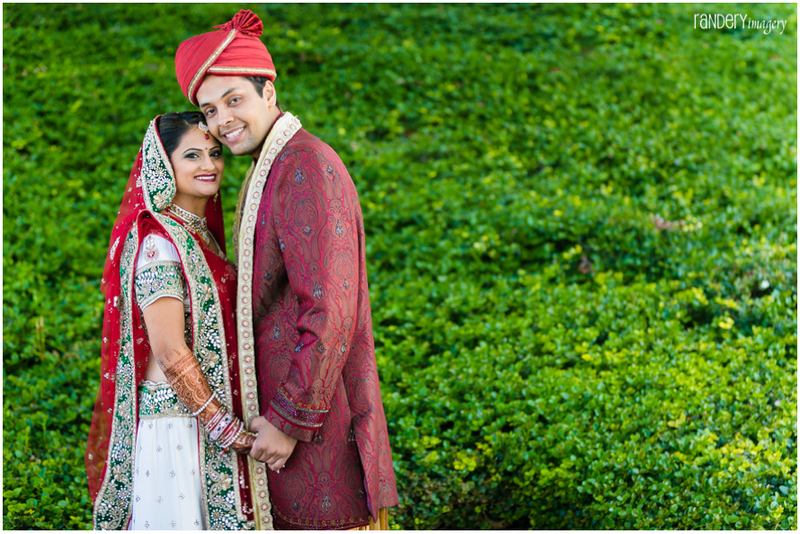 We went with Blue Lotus Insights and really liked their service. How did you decide on the Hyatt Regency Long Beach? I had never attended a wedding there before but my parents had. 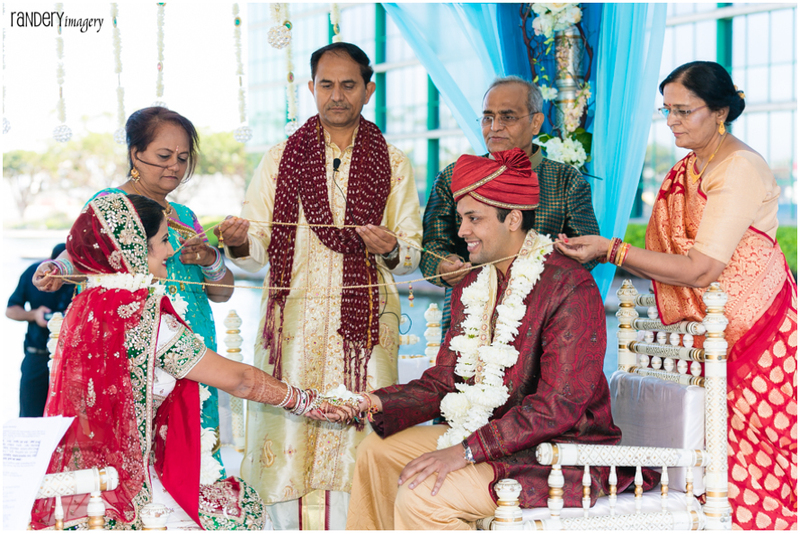 My dad is a pandit for weddings, so he’s been to lots of venues and he really liked the Hyatt. 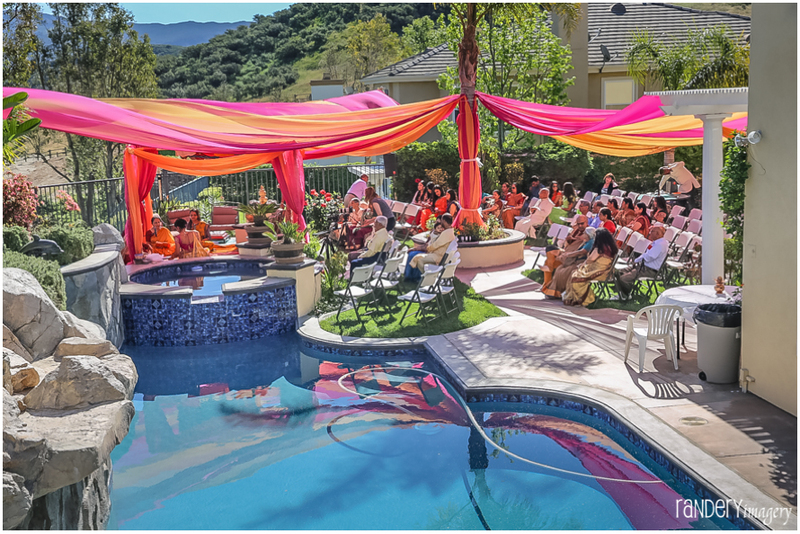 The location, the outdoor ceremony, and the pricing all suited our needs. Our ceremony was in the Lagoon and the reception was in the Regency Ballroom. I loved both areas. 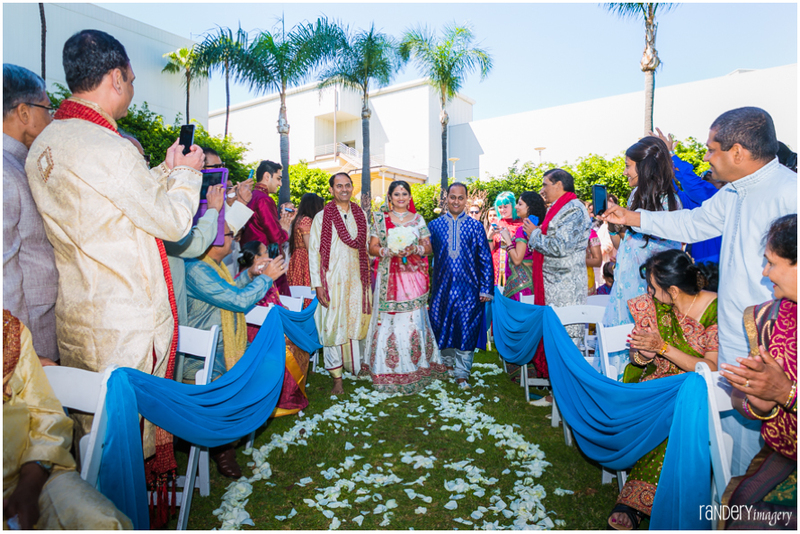 The baraat along the Lagoon pathway is beautiful and fun. 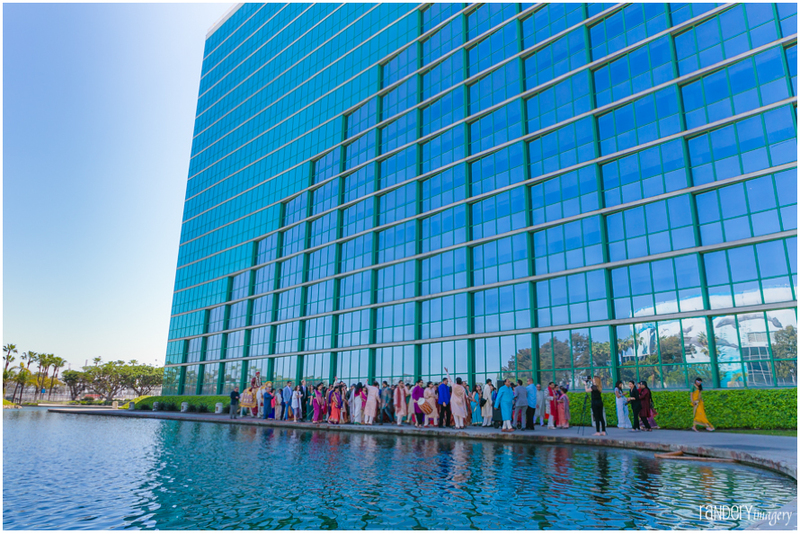 And the Lagoon’s lawn, where the ceremony take place is spacious and serene. There are so many places to do photo shoots during the day and at night. The grounds themselves and the surrounding areas are well lit and great for photos. 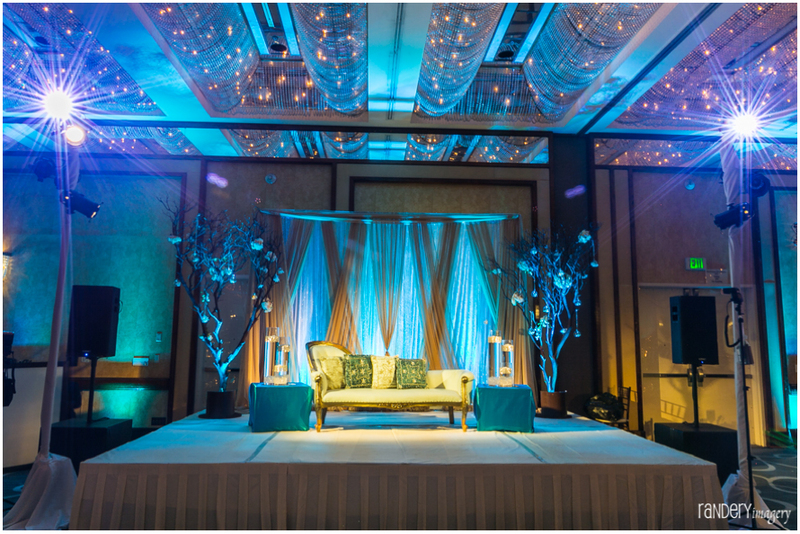 The sweetheart table and mandap were designed by Yogi Patel from Sheer Romance – he really made our vision come to life. 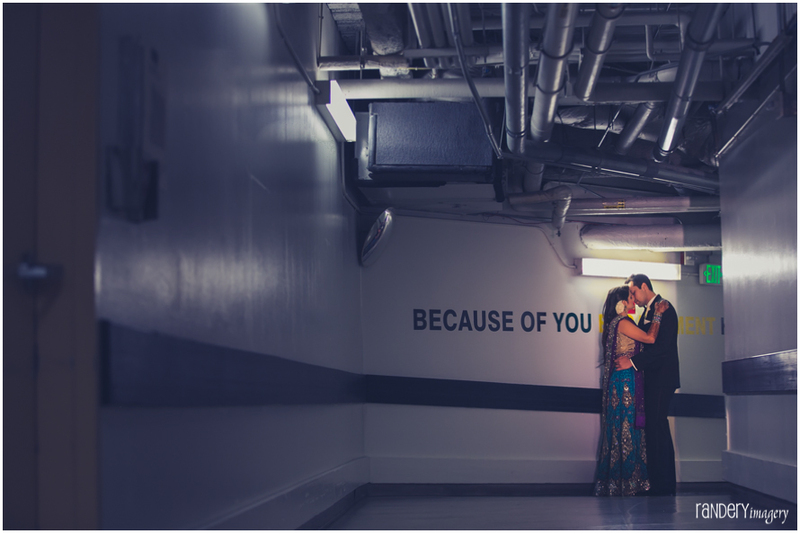 The photo below was taken right before the reception…by the Hyatt’s kitchen. We happened to walk by it with Geeta, our photographer. Geeta and I looked at each other and said we have to take a picture here! It was at the Brookhurst Community Center. At first I wasn’t sure if doing it there was a good idea. But once the room was decorated it looked beautiful. It’s really big – perfect for the 400 or so we had, and it was not far from my parent’s house which was convenient for us and many of our guests. Where did out-of-town guests stay? Anand’s parents and other relatives came from India and Canada. He rented a house in LA on HomeAway (it’s like Air BnB) for them to stay during the week and on Friday everybody checked in to the Hyatt. Most people rented cars but for elders and some family members we arranged pick ups and drop offs – I have a really big family so everyone pitched in and participated. Did you shop in India? Didn’t have enough time. I was there for two weeks but 3 days went into family stuff. There’s another place next door to Sequinze, called Thakur’s Sarees. I didn’t shop there since I found everything at Sequinze but their clothes are beautiful too. I went to Aso Palav in Ahmedabad but they had just finished the Independence Day sales so their stock was really low. So we had to go to Vadodara. That was a special case, Aso Palav is huge, very popular and beautiful clothes! Gauri in Vadodara – I didn’t shop there since I found everything at Sequinze, but I recommend them too. 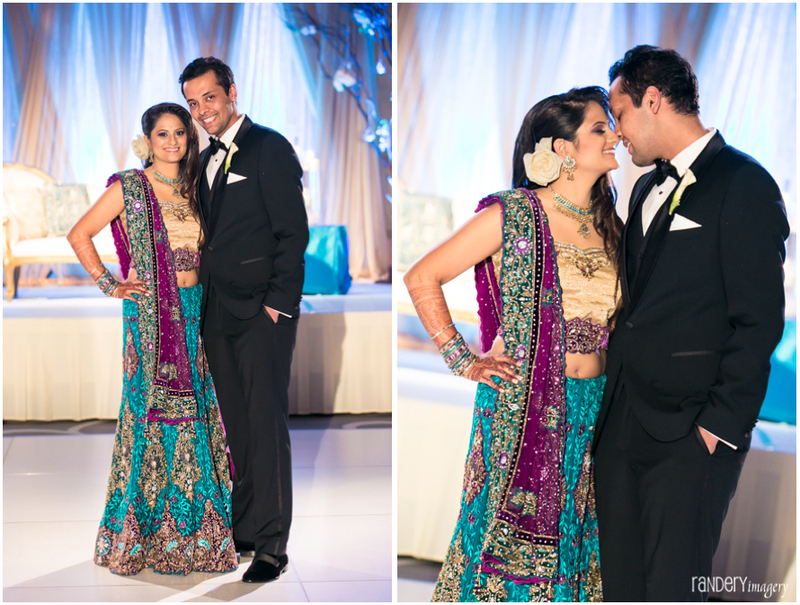 I decided when I was in India to have bridesmaids, and got their matching saris from there. Instead of going to one of these stores, we bought material and got them made. The girls got any adjustments to the blouses they needed, here in LA. 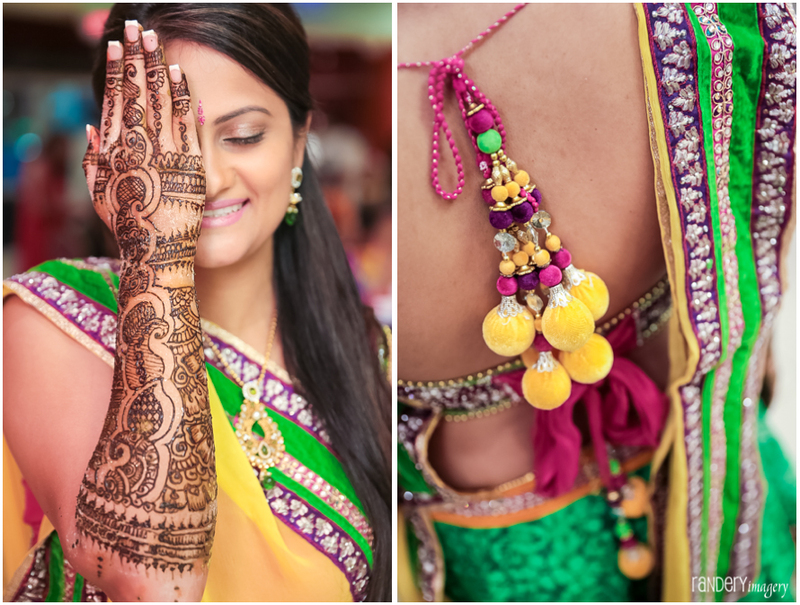 We had our mehndi at Bhima’s restaurant in Artesia – South Indian food. The pooja and and pithi were at our home, catered by Radhe Sweets. 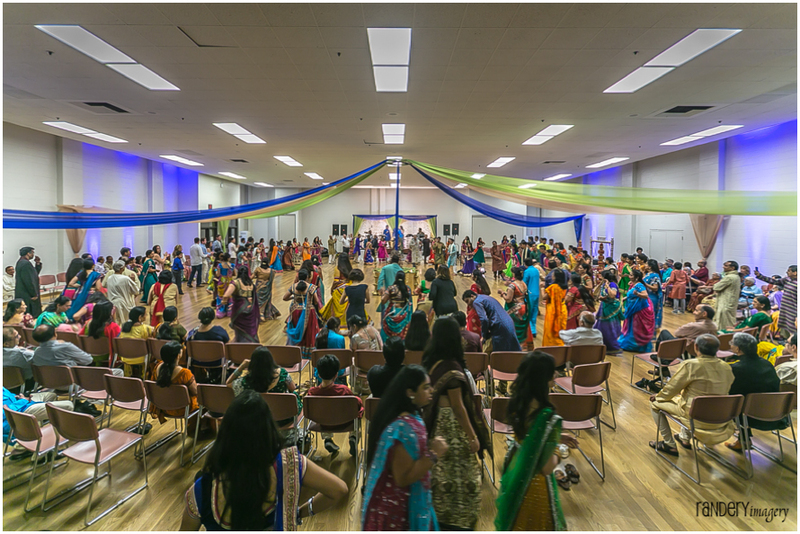 The Garba was at the Brookhurst Community Center and catered by Surati Farsan. 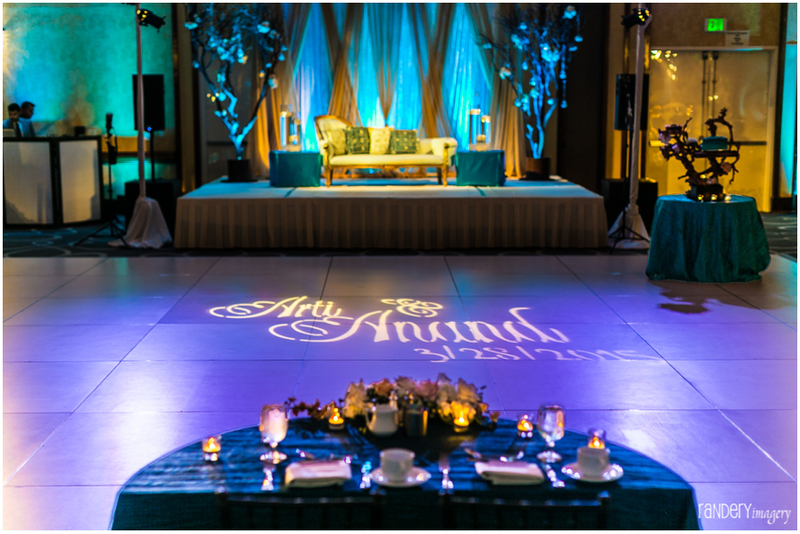 The wedding and reception were at the Hyatt Long Beach and catered by the Monsoon Group. We loved all of the food throughout the wedding week. The Monsoon Group is so unique because of incredible food and presentation. They did a fantastic job! For the wedding we had aloo tiki sliders, passion fruit juice, fruit cups, mango lassi, Bombay pasta, appetizers coconut cauliflower – it was delicious! For dessert some of the more eclectic items were lychee mouse and Ghiraradelli chocolate samosas. And…I didn’t eat at any of my events! But we keep hearing from all our guests how amazing the food was! What advice would you give to future brides/grooms? I don’t remember the wedding. I was nervous and excited at the same time. I don’t remember the decorations. It was such a blur for me. So take a few moments to look around and soak it all in. Do more than 1 makeup trial, especially if you don’t wear makeup on a regular basis. 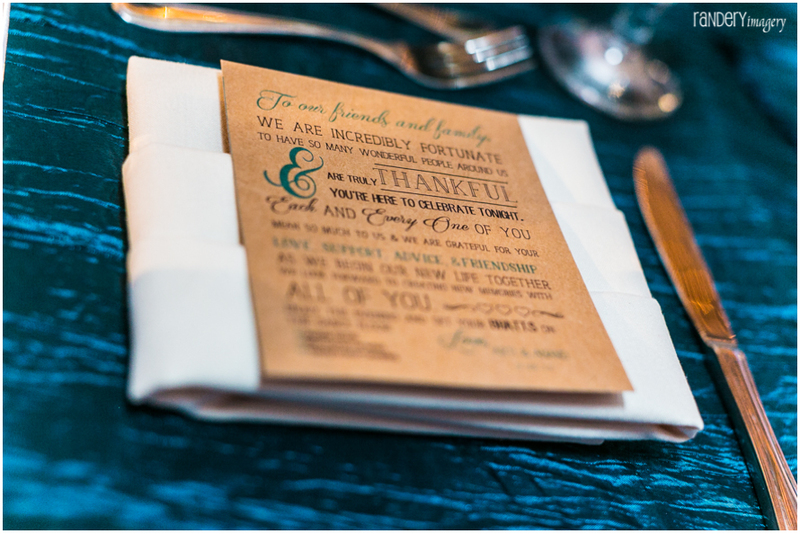 If your ceremony is right at lunch time, consider serving snacks/food before the ceremony. Our auspicious time was about 12:30pm, so after the baraat arrived we served the heavy snacks for about 45 minutes. Then we did the ceremony. 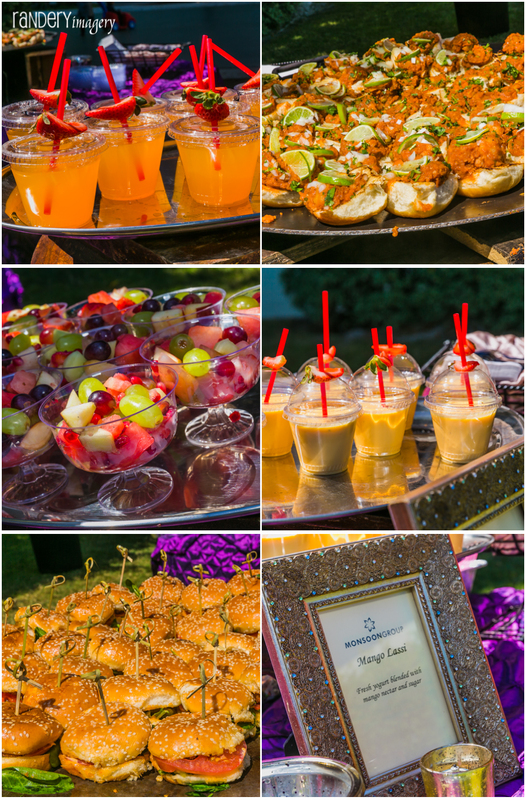 The food was setup in the back of the lagoon area. Where did guests stay throughout the week? Anand rented a house in LA from Air BnB for the week and everyone checked int to the Hyatt on Friday. Everyone sent us their itinerary and we assigned cousins to pick up elders. Most people rented cars. 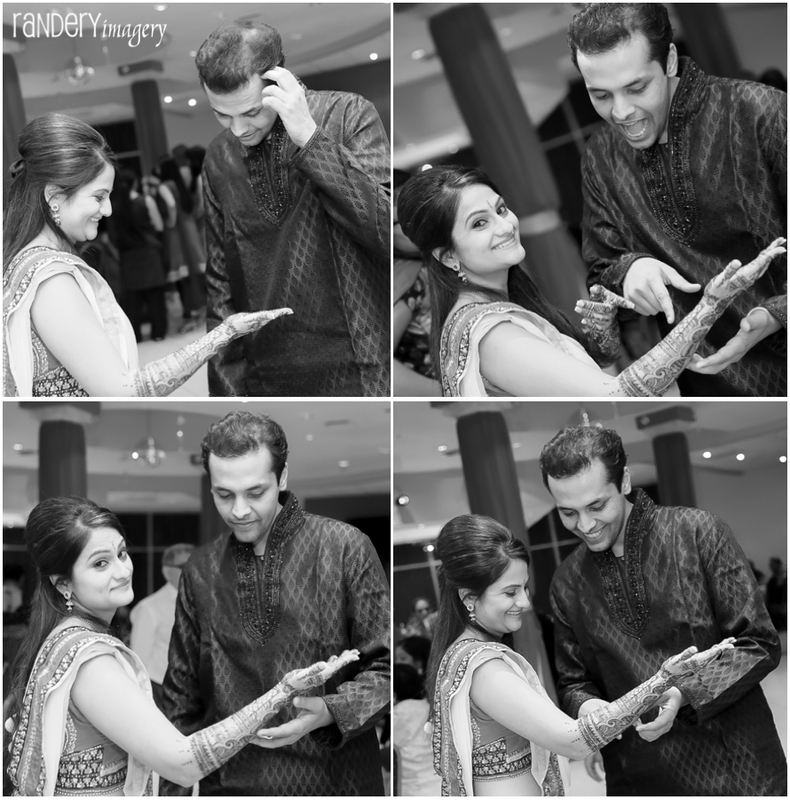 What did people do during the time gap in-between the wedding and reception? Luckily there’s a lot to do around the Hyatt Long Beach so people went to those areas. Also the hotel gave us a changing room. The people staying at the hotel went to their rooms. 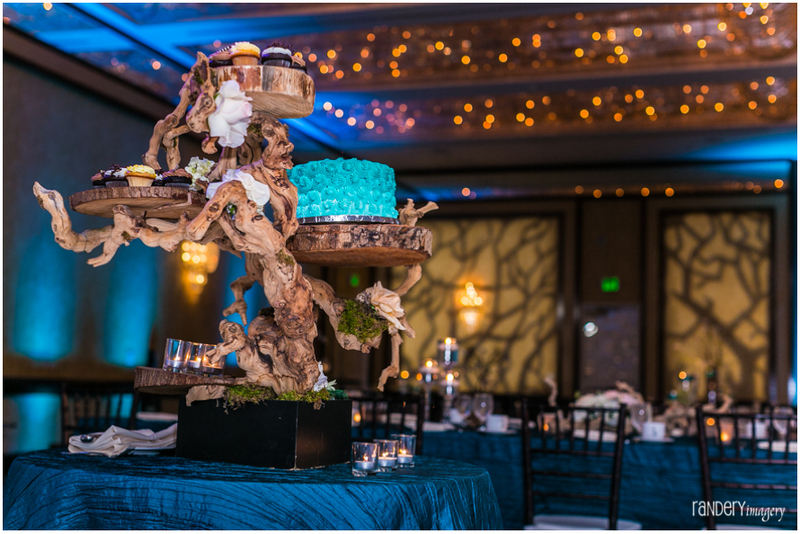 Tell us about the reception decor. 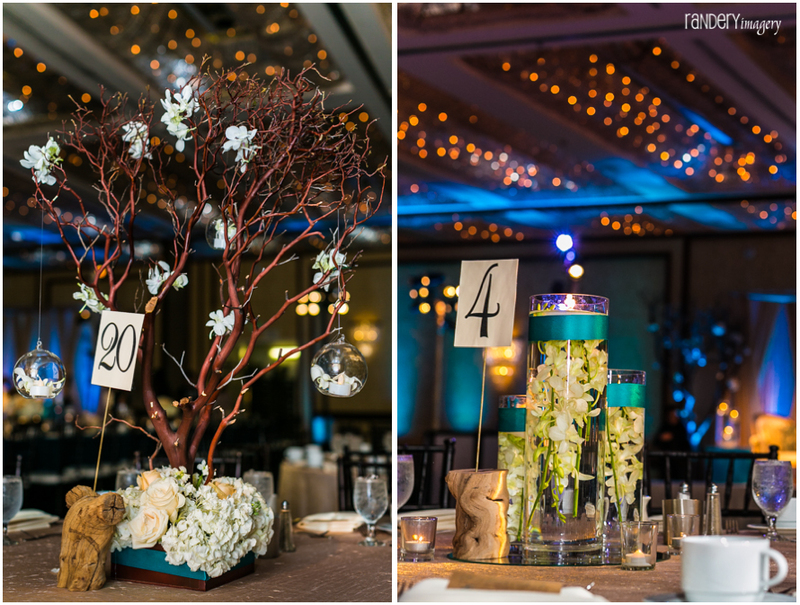 The reception decor design was branches and wood, designed by Capri Flowers. We were so happy with their work and ideas. For the table numbers we bought pieces of wood that were sort of cylindrical and drilled a hole in each. We printed the table numbers and glued them to skewers that we spray pained metallic gold. And we put the skewers inside the drilled hole, followed with superglue to keep them in place. I have a really big family who helped put all of this together. “Get your Bhatts on the dance floor”. Parag was really really good. 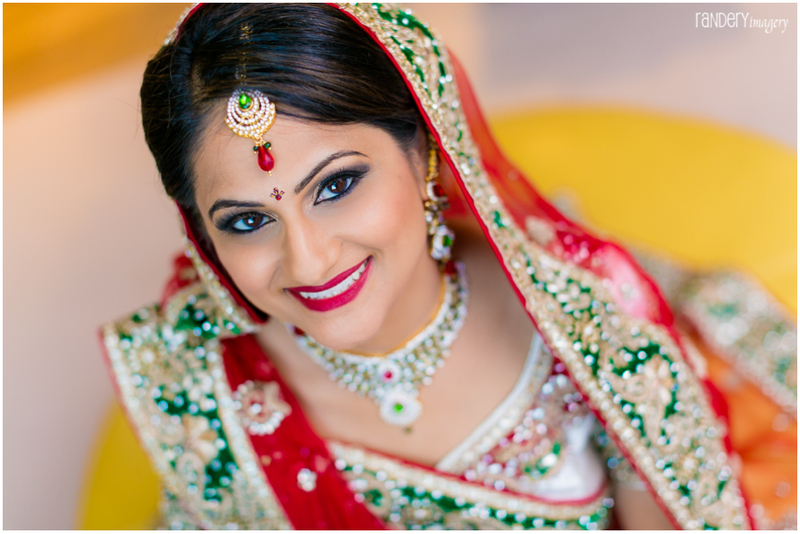 She had done my cousin’s wedding and I really liked all her hair and makeup and she’s a close family friend. Geeta made me feel very comfortable around her and liked her work. Neha and her team are fantastic! From scheduling to the wedding attendant. Amanda was SO great. She turned on music in the room, got me water – it was really nice having her there. They just really made sure that my family and I didn’t have to worry about anything that day. She does a really good job of working with each vendor and coordinating them together. I loved how thoughtful they were! 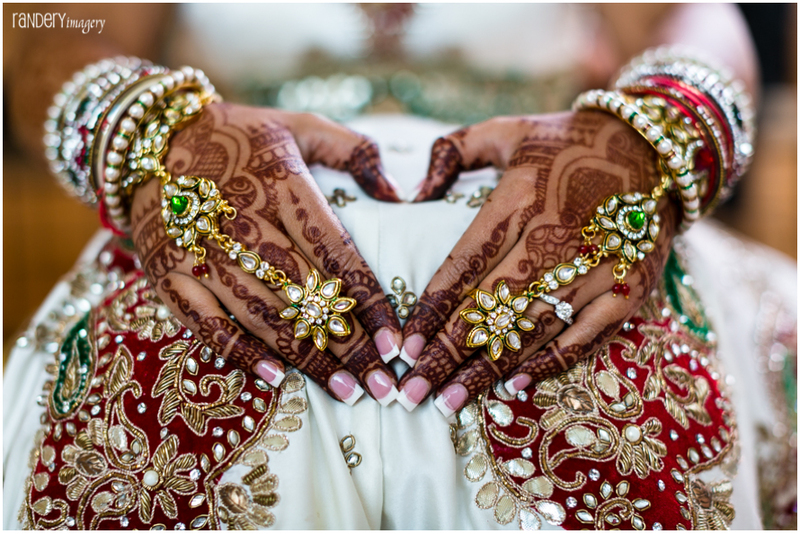 Their staff would text photos from the baraat and send them to the bridal attendant to show me so I could see what was happening. That was really fun and exciting! I appreciated it so much since I couldn’t see the baraat from where I was. 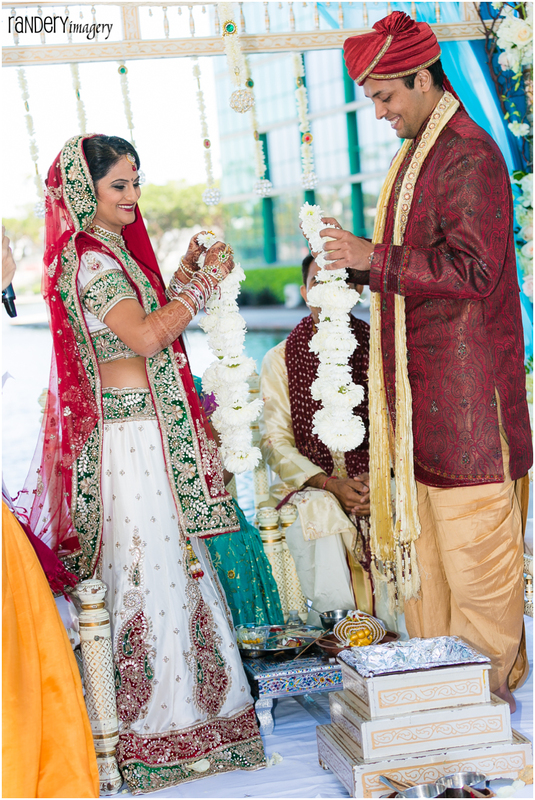 Learn more about desi weddings at the Hyatt Regency Long Beach.